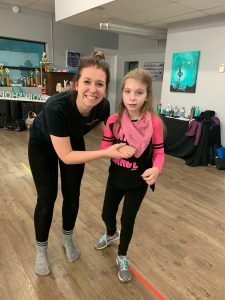 Why join The Dance Ability Movement? We kicked off 2019 by welcoming our first international student, Becca, from the University of South Dakota. Becca is a Doctoral Occupational Therapy student who spent four weeks with us and traveled to all of our studios. You likely saw her bright smile in the lobby and in our classes throughout the month of January! We asked Becca to reflect on her time with The Dance Ability Movement to share with the community. We hope you enjoy! Dancers on a Friday night! Why did you choose this placement? I chose this placement because I wanted to see what role Occupational Therapy played in incorporating dance across the lifespan. Unfortunately, the states do not have many OTs that work in dance (at least that I could find, and I spent a LOT of time searching). Every time I would Google search “dance and OT,” The Dance Ability Movement page would show up. I took that as a sign and went out on a limb to reach out to Mallory to see if there was a possibility that she would be interested in playing a part in my thesis project. After many emails, a Skype call, and me convincing Mallory that it would be a great idea to bring someone from South Dakota up to Toronto, it was official! 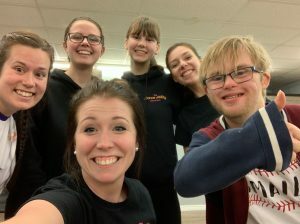 I would be spending 4 weeks in Toronto Canada working with the Dance Ability Movement team! But little did I know the impact the people of this organization would have on my life. What were some of the things you did while on placement? I have learned something from every individual I’ve come across on this journey. I am so incredibly grateful that the big leap from South Dakota, took me on this journey to meet ALL of you! Where do I even begin? I don’t really know how to best summarize the last four weeks into the “most rewarding” but I’ll try. The genuine joy that I felt from the dancers is something that I’ll never be able to put into words. To hear parents say that their child wakes up on Sunday morning and proclaims “It’s dance day” makes me so incredibly happy to know the impact that this organization is having on so many lives. Not only did I have an opportunity to help your child grow, but I think the dancers pushed me to grow as a person. The dancers showed me how every individualized dance move embodies an innate expression of who you are as a person. They taught me how to love and support one another and that everyone is worthy of kindness. The dancers taught me how to laugh uncontrollably, smile so big, and how to be brave. The Dance Ability Movement showed me that everyone deserves a chance to dance. Saying goodbye to everyone. Hands down the most challenging part of all of this. Even though the time here was short, I felt a part of the dance community. I felt like I could walk into any studio and feel the warmth of smiles, hugs, and spunky dance moves. I wish my suitcase was big enough to take all of you back with me, but I promise the weather isn’t much warmer back in South Dakota. Thank you, dancers, volunteers, and parents, for sending all your love my way. If I got to work closely with you or if we only exchanged smiles in the hallway, thank you so much for sharing a small piece of yourself with me. What advice would you have for other students considering a placement or volunteer opportunity with us. Don’t even hesitate. You will NEVER regret a placement/volunteer opportunity with the Dance Ability Movement. Thank you Becca for your contributions and for sharing your experiences with us! 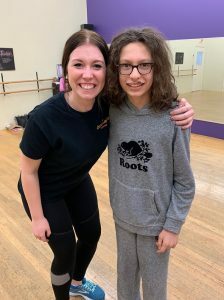 You were a ray of South Dakota sunshine in all of our studios; it was a pleasure to have you join us and we look forward to hearing more about your ongoing journey through dance and OT!